Availability: As scheduled – see below. 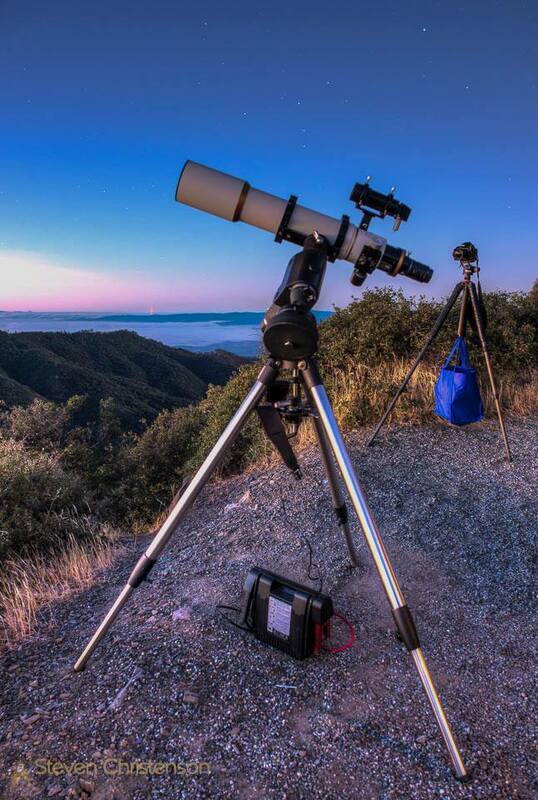 Join Steven in the field imaging the heavens. Location: Will be sent to registrants. Normally there are at most 5 attendees at a time for each event. Location varies based on available targets and the weather forecast but it is never more than a 2 hour drive from San Jose International Airport. We do ask that you keep the site to yourself. 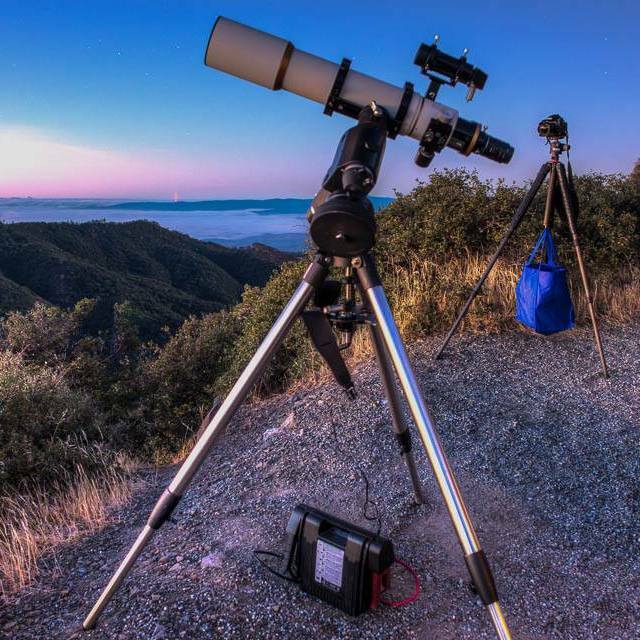 If you’re not familiar with Astrophotography at all you may wish to start with the Astrophotography 101 course, but prior experience is not necessary. The goal of this in the field course is to have hands on experience setting up and shooting images for astrophotography processing. You can bring all your own equipment as well as use equipment provided by us. Five equatorial mounts (different designs). A telescope with mount attachments for Canon and Nikon cameras. Attachment for several cameras at once to an equatorial mount. Mounts include an Orion Sirius computerized mount, a light iOptron computerized mount, an inexpensive motorized mount, a Vixen Polarie tripod compatible mount and an iOptron Skytracker tripod compatible mount. All of the equipment available for use. Click to see a larger image. 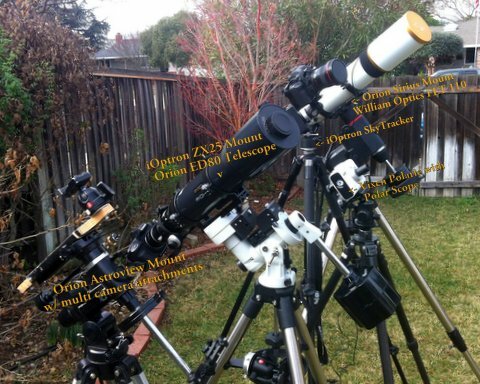 Three Telescopes: An 8″ Dobsonian reflector (not shown – I usually don’t bring it because it’s bulky), an Orion ED80 600mm refractor (blue), a William Optics FLT 110, 770mm refractor (white with gold caps, above). We will meet a half hour before sunset and will go over the targets we will be selecting, how to use a planisphere, and the basics of setting up an equatorial mount. 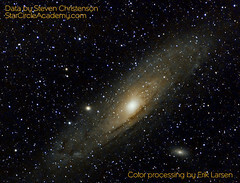 We’ll also cover how to capture the images needed for astrophotography (settings and process). As night falls, we’ll actually set up, balance and polar align our mount(s) and by astronomical twilight we will begin capturing images. 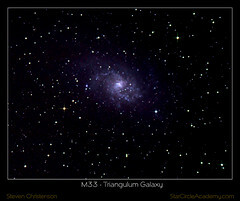 Andromeda Galaxy, The Triangulum Pinwheel Galaxy, the Great Orion Nebula, the Trifid Nebula, the Ring Nebula, and more. We can also try some “wide field” views – shots with landscapes in them. headlamp or flashlight with RED light (only). laptop (if you have one with batteries fully charged), and perhaps a USB cable to connect to your camera. Warm hat, and gloves – yes even in the summer! If you already have a mount, bring that, along with the instruction manual for your mount. Always dress in layers and dress as though the temperature may be 20 degrees colder than the forecast temperature. Some of the sites we meet in restrict access to a specific number of people. If so, you may not bring a guest unless they are paid for (so that we can count them). Otherwise a guest who is a non-photographer may attend for free. We will let you know whether guests are permitted when we send you the site information. How to read a Planisphere. Rotate the wheel to align the date with the observing time. The planisphere displays the star formations for that date and time… and also for prior and subsequent dates and times. Use the “North” side when facing North and the opposite side when facing South. NOTE: The most interesting part of the Milky Way is found to the south! 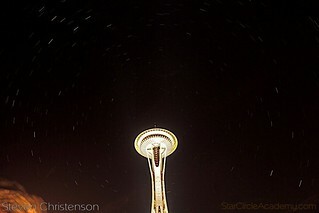 Find the North Star (Polaris). 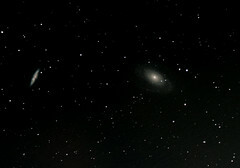 It’s good to know about Merak and Dubhe – the stars in the Big Dipper that point to Polaris – but that may not be enough. It’s better to also know also that Cassiopeia is on the far side of the Big Dipper. It is where some faint Milky Way is visible, too. Cassiopeia is in the upper left of the image below. The last two stars in the Big Dipper (Ursa Major) are in the lower right. When going to dark sky sites, locate Polaris as soon as possible. Once the sky grows dark it may be harder to spot! How to pick targets in the night sky (Higher is better!) Astroplanner is a good tool, or look at the Planisphere. Pick western targets before eastern targets if sky conditions allow. Set up and level the legs of the mount by adjusting the height of each leg until the top of the mount is level and the north leg is as close to due north as possible. Attach the telescope (or tracking bar) to the mount. If using a telescope, extend the dew shield and attach any dew straps or hand warmers for dew prevention. Attach a camera, and the counter weights. Rotate the mount around the right-ascension axis so that the counterweight bar is parallel to the ground. Lock the RA access. Focus the camera on a distant object. This is important as the camera is heavy so if it’s not approximately in focus position, the center of balance will change. Lock the RA axis and carefully unlock the DECL axis. A properly balanced axis will not move. If not balanced, loosen the plate clamps (where the telescope bar attaches to the mount). Slide the mounting bar left or right over the plate until the DECL axis is balanced. Retighten the clamps. Point the DECL axis due north and lock the DECL axis. Next balance the RA access. CAREFULLY loosen the RA lock/clutch. Adjust the location of the counterweight(s) until the RA axis is balanced (i.e. doesn’t “fall” in one direction or the other when released). Usually balance can be achieved by moving the counterweights along the bar. If the counterweight is moved all the way out and the telescope side is too heavy, you need to add another counterweight. Check and adjust the aim of the finder scope (if present). Replace the camera with a diagonal and reticle eyepiece. Adjust the focus for the reticle. [Note if you do not have a Reticle, diagonal and eyepiece, you can often perform the next steps using live view on the camera. Make sure to connect the power, and all necessary cables. Double check that the cables don’t snag or bind as the device rotates around the RA and DECL axes. STOP: Wait until it is dark enough to see Polaris, then see step 7: Aligning. Level the tripod for a SkyTracker as accurate alignment requires the device to be level. Wait until dark to align with Polaris. You can begin alignment as soon as it is dark enough to see Polaris. Adjust the latitude (raise/lower) using adjustments provided (depends on the mount). Rough adjust the direction using the east-west adjustments. Adjust the east west (azimuth) and the up/down (altitude) until Polaris is visible in the polar scope. Fine tune the adjustment as described by your manual. If using a “Go To” mount, you must complete additional steps so the computer knows where it is pointing. Again, how do do this varies by device, but in general the computer (hand controller) will suggest a star, move the telescope to point to that star, and then you must use the hand controller to make move the star into the center of the reticle on the eyepiece (or if using only a camera, a well defined place on your camera screen). Wait until astronomical dark before attempting photography (except for the moon), but before hand, select and move to a target. Double check tracking (the object should stay steady). Use the time until fully dark to fine tune the alignment. If you have alignment licked before astronomical twilight ends, then you can cap the telescope/camera and take some dark frame exposures. Once it’s fully dark, it’s time to double check the focus and attempt your first LIGHT frames. Best way to get good focus is to point at a moderately bright star and use a Bahtinov mask. Sometimes getting focus using Live View and e.g. Sirius or Jupiter will work (watch until Jupiter’s moons become pinpricks of light). Once focus is good, take a dozen FLAT frames using your iPad as the light source and with the camera set to AV mode. Set the camera to manual and the highest possible exposure speed, cover the optical path and take a dozen BIAS frames. Reset the camera to manual. Point back at your target and take LIGHT frames until the cows come home. NOTE: If your target is in the western sky, it may help tracking to slightly move the counterweight toward the camera (make the western equipment slightly heavier than the eastern side). When done for the evening, remember to cover you camera (you can remove it from the telescope and put a body cap on it), and let it take DARK frames while you take down the rest of the equipment. William Optics FLT110: The size of the front objective lens is 4.3 inches. The dew shield on the FLT110 has an outer diameter of 5 3/8 inches (137mm) so a Bahtinov mask or a solar filter must be at least that large. The tube rings on the FLT110 are 1″ thick. Hello, I have paid for the 201 class on Jan 25. After attending he 101 class I purchased the Orion ED80 telescope and the iOptron ZEQ25. I am hoping to bring both to the class to learn how to set them up correctly. My question is, I see in the photo you have a battery pack of some sort for your mount. Can you please recommend a good battery pack that would be good for my setup. Thank you. Dennis, I elected to get the “iOptron Battery Counterweight” because it’s super clever. However any 12 volt battery with a CLA (cigarette lighter adapter) socket should do the trick. I usually have a spare with me. a. The battery listed weighs about 60 pounds. That’s heavy. b. You’ll also need a smart charger to pair with that equipment. I’ve gotten good use out of two different “jump start batteries”. My now dying (but 5 year old) 8AH jump start battery weighs only about 12 pounds and it will run my biggest scope or my dew heaters all night. I also have a second one purchased in a hardware store that is about twice as heavy. I’ve given some serious thought to switching to LiPo (lithium polymer) or LIFePo4 (lithium iron phosphate) they are about 1/4 the weight for the energy. The problem Lithium is more fickle in colder weather. For example this battery pack weighs 4 pounds. Yeah, good ideas. I also liked the info at this website, and am planning to use a Marine/RV battery as well as a cheap hand cart from Harbor Freight. Haven’t considered the LiPo (lithium polymer) or LIFePo4 (lithium iron phosphate). I will now. Thanks!